In this episode of the TiLT Parenting Podcast, I talk with Ann Douglas, author of the powerful book Parenting Through the Storm, originally released in Canada and now available internationally. 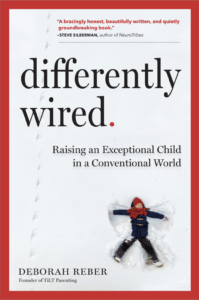 Ann has successfully raised four differently-wired kids and shares her insight on what it takes to navigate the ups, downs, and curveballs that are part of parenting atypical kids. And as a differently-wired person herself, Ann’s perspective is invaluable and full of hard-won wisdom. In our conversation, we tackle the topic of negative stigmas—why they exist, how they’re perpetuated, what they do to us and our kids, and most importantly, what we can do to combat them. This is one of my favorite things to talk about, as I believe it’s only by openness and transparency that we change the conversation around difference and challenge the negative stigmas that exist. I hope you enjoy our chat! About Ann: Ann Douglas is an author, magazine writer, newspaper columnist, and speaker who sparks conversations that matter. She is the author of more than 27 books, including her most recent book Parenting Through the Storm: Find Help, Hope, and Strength When Your Child Has Psychological Problems. Find out more about Ann at www.anndouglas.ca.